Let us show you the real authentic Tuscany standing in a wicker basket thousands of feet up in the air, looking down at forests, vineyards and historic towns. Then let us serve you a glass or two of Prosecco and a breakfast to remember, from our local markets with pastries freshly made the same morning by our local bakery. Ballooning in Tuscany is a small professional balloon rides operator licensed for Commercial Air Transport (CAT) by both the British and Italian Civil Aviation Authorities. It is owned by the same person who owns and operates Virgin Balloon Flights in the UK with a fleet of 25 large balloons with highly qualified pilots providing impeccable service and safety standards. We retain the same focus on the safety and enjoyment of our passengers in Tuscany as we do in Britain, but because we are a small team we believe we can provide an even more personal and enjoyable experience. 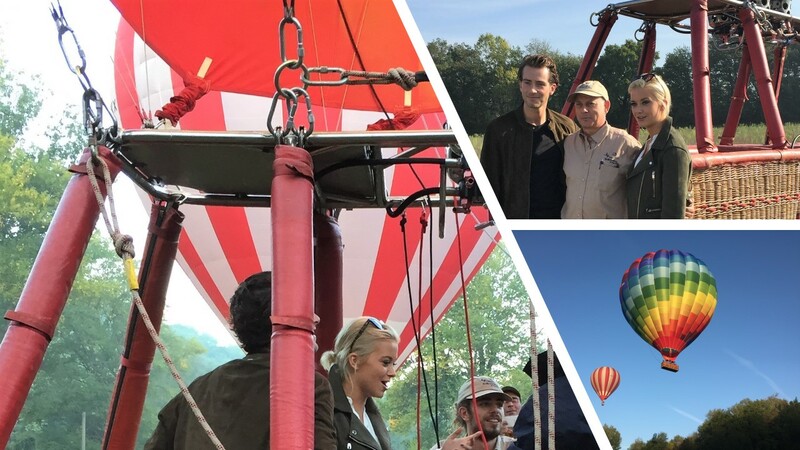 Here we are, the Ballooning in Tuscany team ‘on set’ with the Made in Chelsea cast. We flew stars Olivia and Digby, who took to the skies for a romantic flight over Montisi. Their love blossomed under the Tuscan sun during a spectacular balloon ride. In Liv’s words from the episode: “That was actually amazing. I loved it.” The episode featuring our beautiful big balloon aired on E4 in the UK on Monday 13th November 2017.